If you are anything like me, I used to think that LESS was more. If I ate less, I would get better results. Boy, I couldn’t have be more WRONG!! Fueling your body prior to your workout, will allow you to have energy for maximum performance, and fueling your body after your workout allows for building muscle, and to help optimize recovery. Both are instrumental in helping to build muscle and lose weight. As if that is not enough to think about, it is also important to mention that TIMING IS EVERYTHING!! If you eat too early or too late, or not at all, you won’t be getting the same results. It is important to eat within 30 to 60 minutes pre-workout, then again within 30-60 minute post-workout. Pre and post workout meals should be an estimated 50% of your total daily carbohydrates. This is when your body needs the most energy and will utilize the most glycogen to help the body recover. There is a lot of misconceptions on what you should be eating prior to your workout. If you were to go and do a Google search right now, you would find an overwhelming number of opinions. A pre-workout meal should be designed to supply energy to help with performance. In other words, what you eat should give you the energy to push yourself through and to finish your workouts. Have you ever gotten halfway through a workout and feel like you have lost all energy? Are you one that skips meals prior to your workout (especially if you workout early in the morning)? Odds are it is because you are either not eating, or not eating the right things at the right times. Preworkout meals should focus primarily on carbs and proteins. Carbs help to restore Glycogen. During exercise Glycogen is converted to Glucose, which plays an important role in muscle contraction. Preserving muscle glycogen helps to increase muscle growth. I could write an entire article on how carbohydrates are converted and how that works with the cells in our body, but we will save that for another month. Protein helps to maintain and increase your muscle. It increases amino acid production in our blood, which helps to boost muscle building. A lot of people are under the impression that it is all about eating protein pre and post workout to increase muscle mass, but again that is wrong. You want to combine both proteins and carbs and you will start seeing a difference. 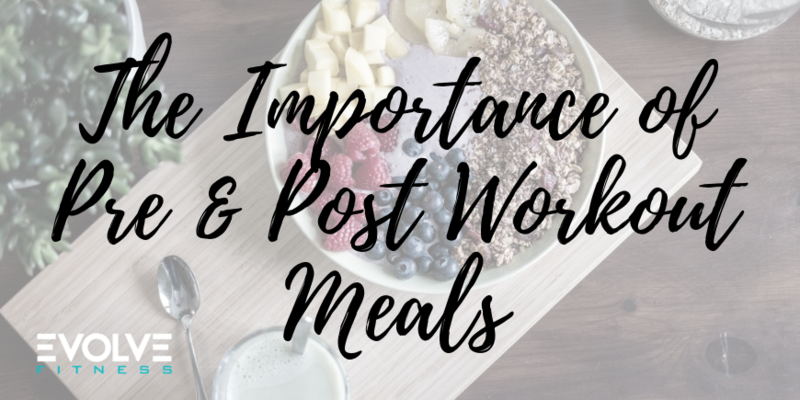 Your post workout meal is probably the most important! Feeding your body after burning all the calories from exercise helps it to repair. If you don’t eat within that 30-60 minute window post workout, your body is going to start using the protein in your body. So what should you eat post workout? Same as your pre-workout meal: protein and carbs! Eating protein and carbs will allow your body to re-stock your glycogen that was depleted during your workout. This will reduce muscle protein breakdown and can also help to reduce muscle soreness and fatigue. If you want to start seeing more results in the gym, I would suggest that you take a look at what your pre and post workout meal routine looks like. A good place to start is by eating a pre and post workout snack and then take it from there. You will feel more energized during your workouts and will likely have less soreness the day following your workout.